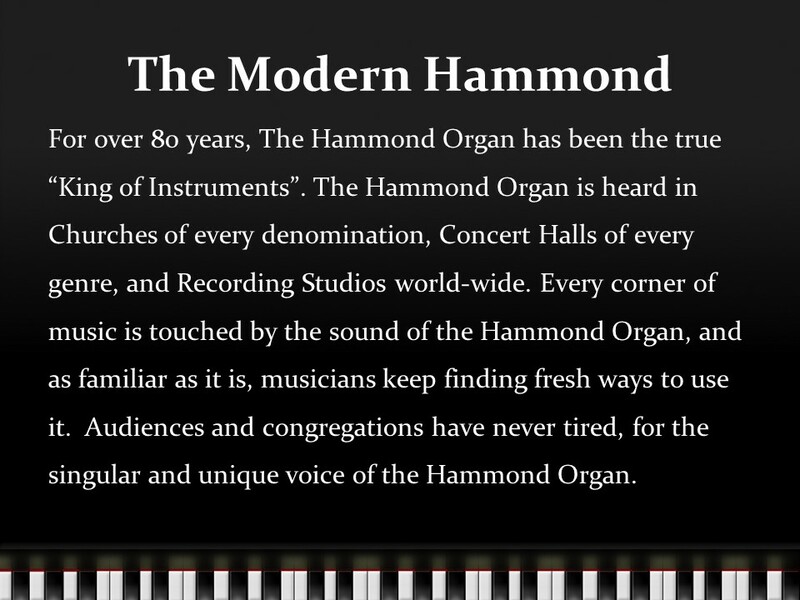 It is impossible to think of a Church Service without hearing the Hammond Organ singing along. It’s tradition, it’s inspiration, it’s comfort and it’s forever. In short: It’s the SOUND, the SOUL, the ONE! Time marches on, and the revered Vintage Hammonds of the past 80 years are now antiques. Parts for them are scarce and upkeep is expensive. 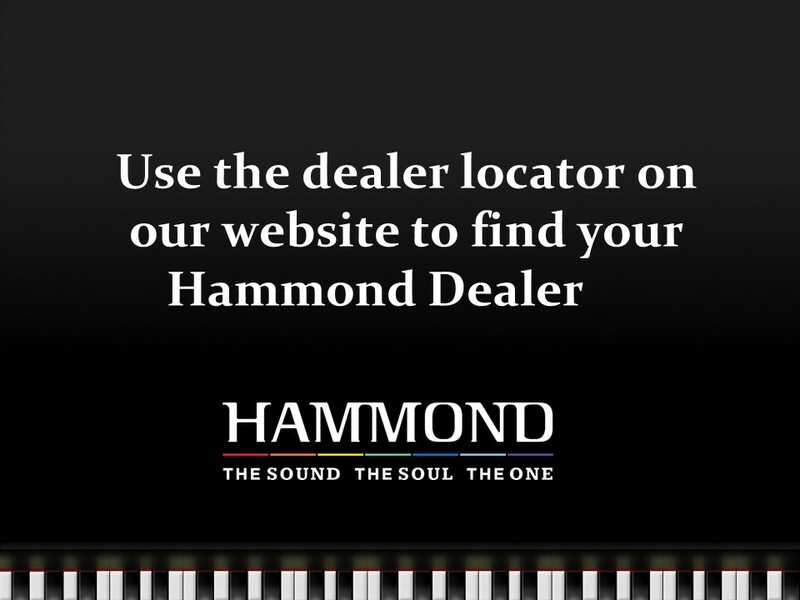 Luckily, Hammond Organ knows and respects the Church’s traditions, and offers a line of instruments that keeps those traditions, with the sounds (and looks) you have come to love, trust, and confide in. The march of time has brought new music to your Worship, and Hammond has kept pace, with the ability to jump generations with the greatest of ease. Economic considerations are always at the forefront, and Hammond has made sure each of our instruments packs the mighty punch of the iconic B-3; from our entry level Xk-1c, through the revolutionary new Model A-3, clear up to the B-3mkII, a “spitting image” of the Classic Organ. Low price brings no compromise in power or quality of sound. Many Modern Hammonds also feature voices beyond the familiar ones, those of Acoustic/Electric Pianos, Strings, Brass, and Synthesizer, to name a few; these to compliment the contemporary sounds of Worship. Renew your faith and confidence in the King Of Instruments. 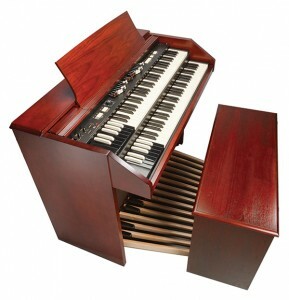 Bring a NEW Hammond home to your Church. Electro-Mechanical Tone Wheel Generators Hammonds have not been built since 1975. Very few different models are available. OEM Factory Replacement Parts are not available. Replacement Parts need to be sourced from old scrapped organs. A fine quality Used Hammond can cost up to $15,000. Financing used organs is difficult. No warranties are available for used organs. Hammond digital technology using 96 digital tone wheels duplicates the exact drawbar sounds of its classic predecessors. 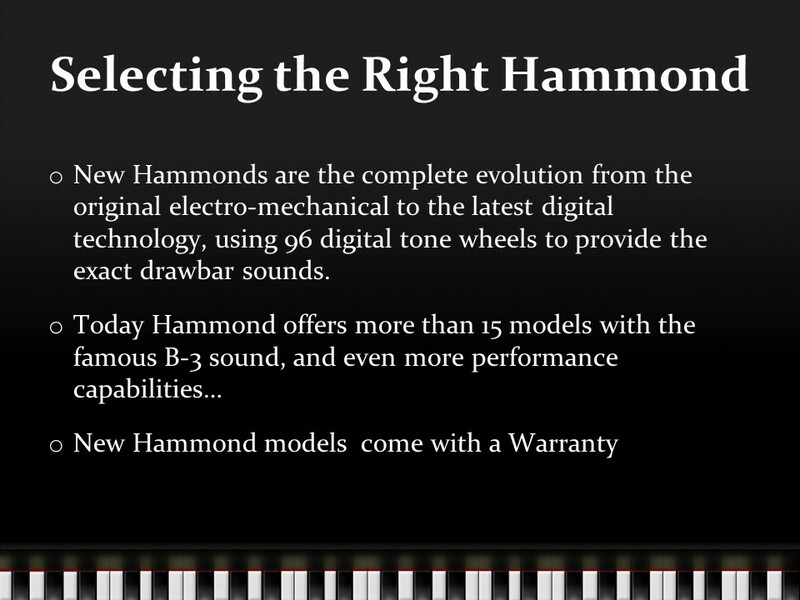 Hammond offers more than 25 models with the famous B-3 sound. All New Hammonds have replacement parts readily available and a trained national network to fulfill all service needs. Replacement Parts are factory certified and carry a five year warranty. 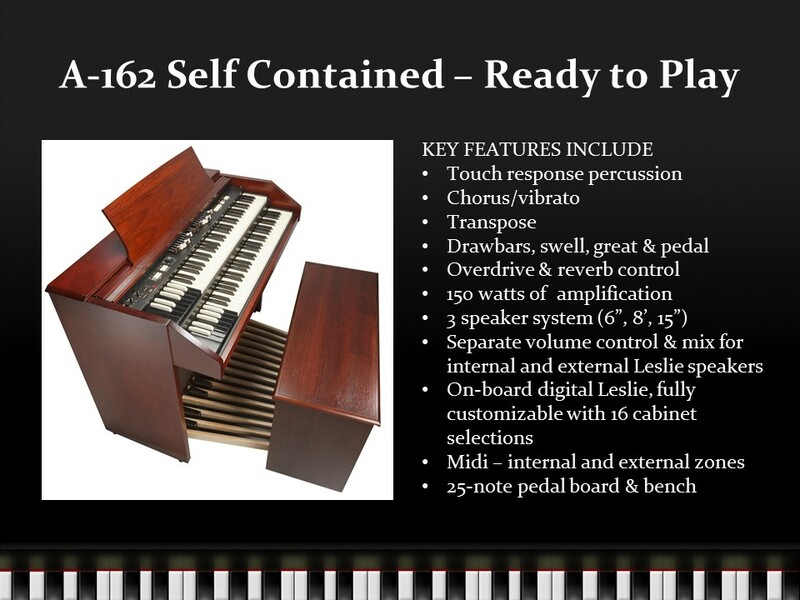 New Hammond Organs can cost as little as $2,000. 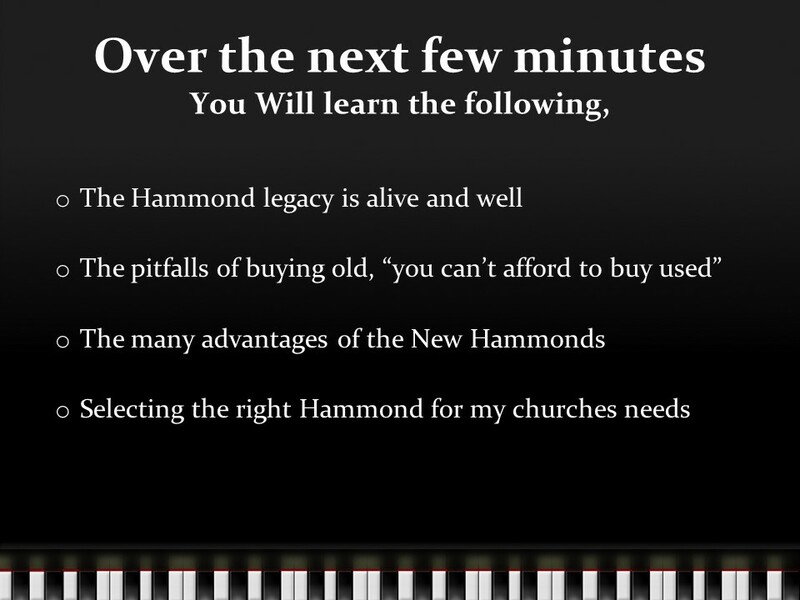 Hammond has several Church Financing solutions available for new Organs. 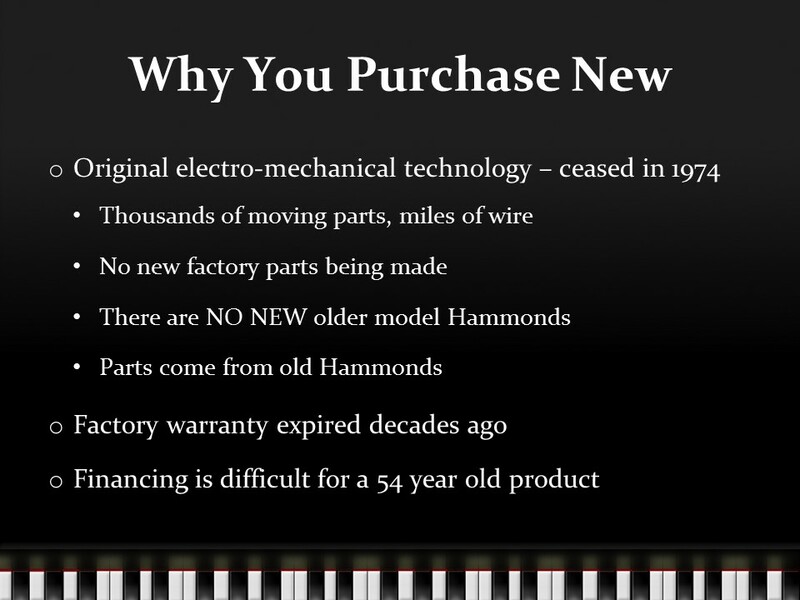 Hammond Organs have up to a five year warranty on parts and one year labor. 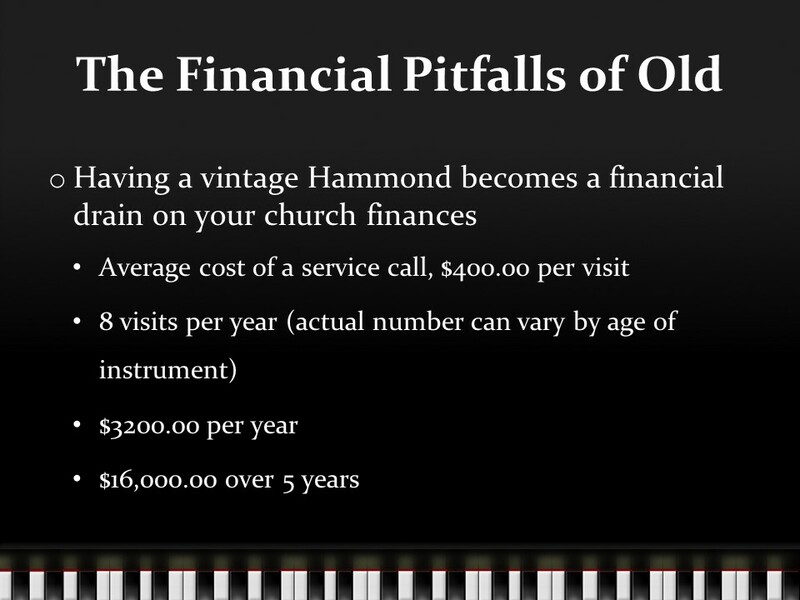 Your Church has decided to own a Hammond organ, or perhaps replace an older Hammond that has seen better days. Foremost in this process, Your Congregation wishes to keep the purchase within budget. A quick scan of the market shows pre-owned Hammonds are available at attractive prices, but the final cost can be much much more. Hammond ceased production of electro-mechanical Organs in 1975, meaning the newest “old school” instrument is at least 40 years old with the majority of classics in the 50-60-70 year old range. Although Hammond’s build quality was (and is) heroic, and many of their voices are still majestic, these instruments legitimately qualify as Antiques, with all the potential drawbacks inherent as such. The Antique Hammond you buy will not be a museum piece, but a workhorse called upon for constant use. Although the initial price can be reasonable, few sellers will mention the costly maintenance to keep an Antique Hammond in a condition that inspires confidence. This is the primary source of most dealers’ income. 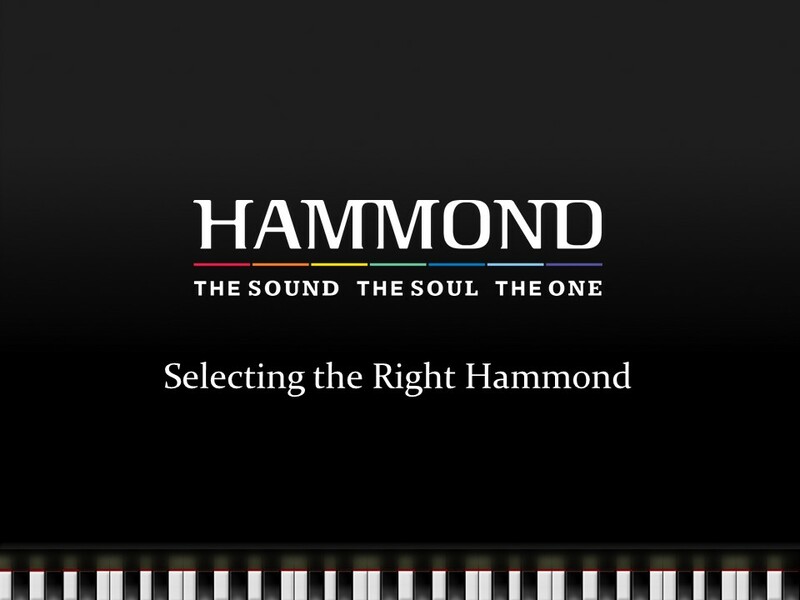 The 21st Century Hammond Organ Company does not manufacture or stock the components and parts required by Antique Hammonds. Repair and service of these instruments relies on stripping parts from existing Organs. In light of this, one can see there is a finite (and ever-dwindling) supply of parts, and as the parts become scarce, their cost rises. The electro-mechanical Hammond had thousands of moving parts, the failure of any single one could render the organ unplayable, and when you factor in the unpredictability of any Antique’s performance, the greater picture is one of diminished confidence. Can you manage the risk of powering up your Antique Hammond on a Sunday Morning only to find it mute? 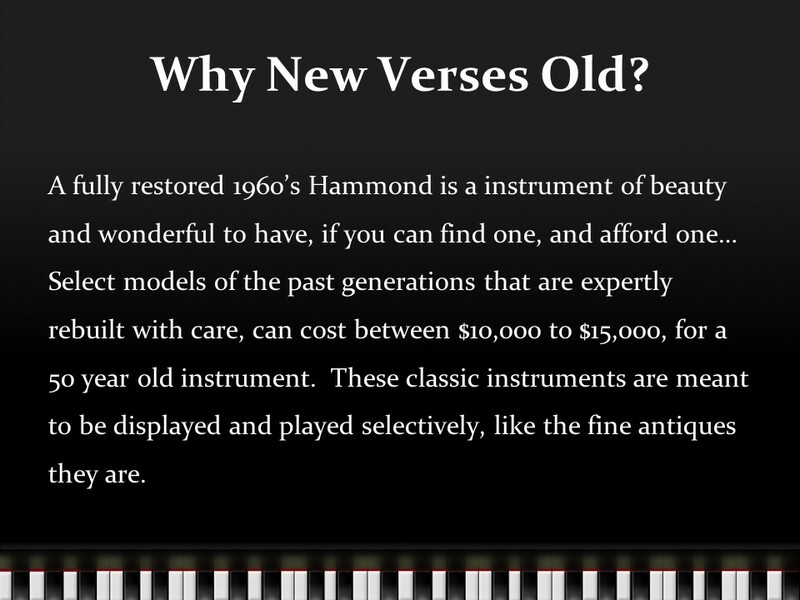 Conservative estimates put the yearly upkeep budget for an Antique Hammond at $1000-$1500. Add that to the original cost of the instrument, over time, and you’ll find the Pre-owned instrument is hardly the bargain it seemed. New Hammond Organs have been painstakingly engineered to play and sound like the Antiques of Legend. They achieve this using cutting-edge digital technology with a bare minimum of moving parts. A further advantage is a factory warranty for parts and labor. In the rare case of malfunction, modern diagnostics allow swift repair. Our product line offers a wide array of models with prices beginning less than $2000, and every one has the sound and feel you expect and demand from a Hammond Organ. We even have models that include other voices like Pianos, Electric Pianos, Orchestral Voices and many others to support the eclectic styles of Praise Bands, always with the capacity to return home to the grand sound of Hammond. Many of our models also have Classical/Church Pipe Organ divisions which can bring the traditional majesty back to your Church, if you’ve surrendered your Pipe Organ due to the spiraling costs of tuning and maintenance. We have the exact model you need for the exact price you wish to pay. 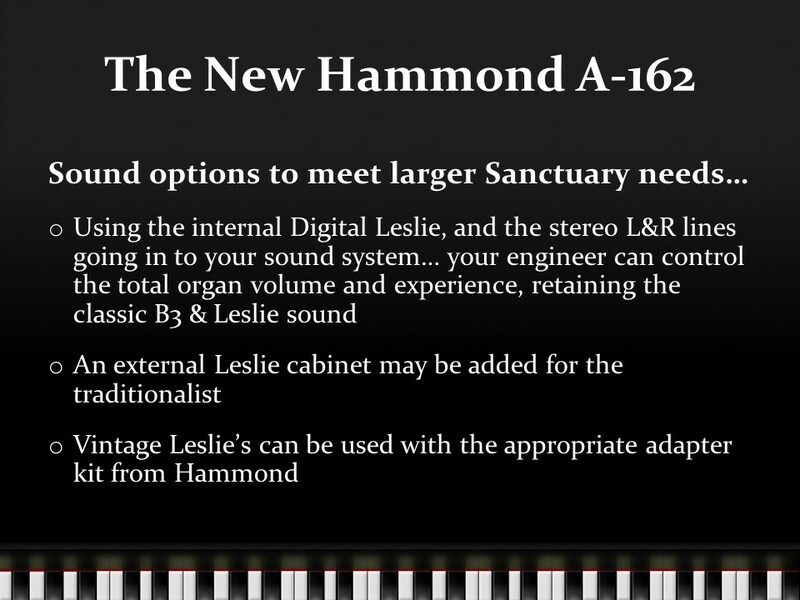 Another major advantage you have with new Hammond organs is their lighter weight. Our B-3mkII (With traditional Hardwood cabinet) weighs 50% less than the original B-3. Our New Portable B-3 weighs even less than that, and can be set up and taken down in a couple of minutes. From the standpoint of convenience and economics, you should definitely consider a new Hammond organ for yourself and your church. You won’t be able to detect any difference in sound quality, playability and touch between it and an older Hammond, and you will have a lightweight, versatile instrument that will last for many years. 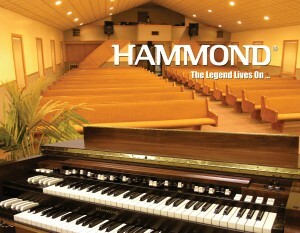 The Hammond B-3 has remained the flagship for 60 years for the Church Communities. The Original B-3’s have not been produced since 1975, and as Antiques, require sizable annual budgets for on-going maintenance and service. The New B-3 with state-of-the art Hammond Digital technology reproduces both the same historic organ sound and classic keyboard touch and feel, as its famous relative. Our Church Needs More Than Just An Organ…Which Sk Stage Keyboard is right? Modern Church music has grown to encompass a wide range of styles, from “Old School” Hymns to the most progressive sonic creations. It takes a special instrument to make that generational leap. 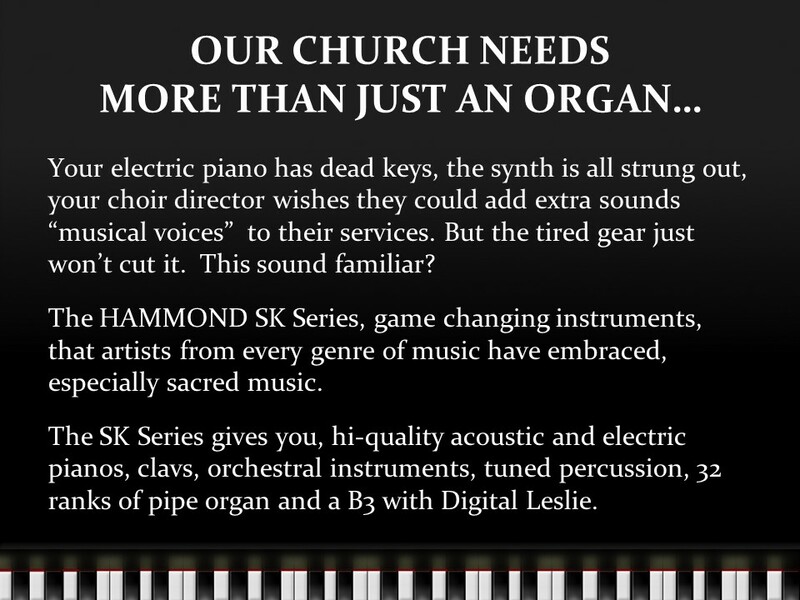 Hammond’s Sk Stage Keyboards are the perfect fit for YOUR church. At their heart, every Sk Keyboard features a full and genuine Hammond Organ and Digital Leslie which brings all the power and majesty of the Traditional Hammonds you’ve known forever. The Sk’s go beyond, with a Hi-Def Acoustic Grand Piano which has set the keyboard industry on its ear. Expressive as a top Concert Grand, you access this incredible voice at the flick of a switch. Similarly, the two most useful and popular Electric Pianos and Clav are available. Orchestral Brass and Strings, Tuned Percussion, Synths and an extensive Accordion are further beneficial sounds, and that’s only scratching the surface. In addition, every Sk has 32 ranks of Digital Church Pipe Organ voices. If you’re a Mobile church, our 15 pound Sk1 will be right. The 61-note manual (same as a B-3 keyboard) is perfect. This is also the perfect keyboard to use atop an existing Hammond, as it will add a 3rd keyboard to expand the Organ range, and it has the pianos, etc spoken of earlier. If you need a little room to stretch out, opt for the Sk1-73, which is identical in spec, but features a 73 note keyboard. The Sk-1 88 is for the dedicated Piano player. 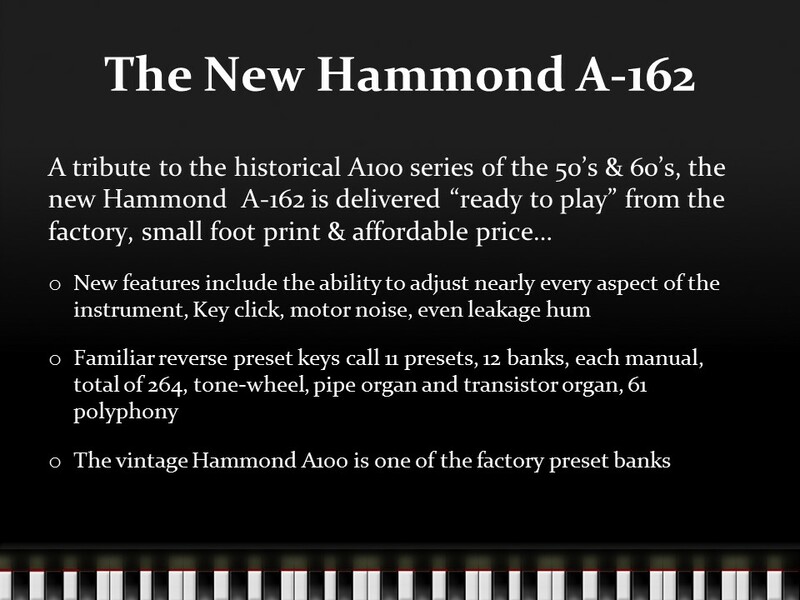 The first Hammond to come with 88 regulation-size Piano keys, its proprietary design give you the feel of a fine Grand Piano, but allows all the sweeps and moves unique to playing the Hammond Organ. Finally, the double-61 Sk2 can put your Pianos and Extravoices on one keyboard, and Organ on the other, or it can be played as a double keyboard organ. The Sk2 weighs 35 pounds with a very small “footprint”. All the Sk Stage Keyboards have the same tonal specs. Choose which keyboard configuration works best for Your Church.